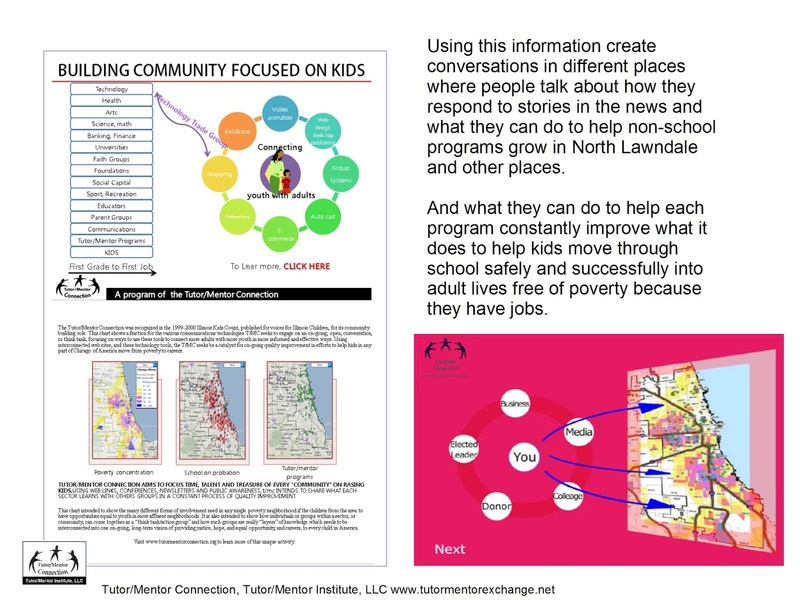 In the 4-part strategy created by the Tutor/Mentor Connection in 1993 to support the growth of mentor-rich non-school programs in Chicago's high poverty neighborhoods, step 2 focuses on building public awareness and drawing needed resources to the youth organizations already operating in these areas. Since T/MC had no money for advertising, other ways needed to be created to build on-going public awareness. The "Rest of the Story" strategy was invented for this purpose. You can find examples of this in many past articles on this blog, and the Tutor/Mentor blog. Following is an example. 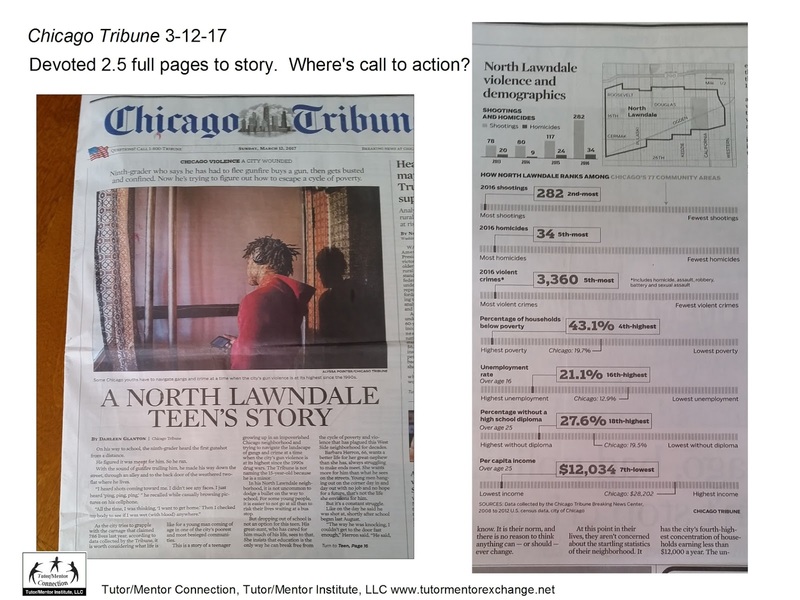 The graphic above shows an article on the front page of the March 12 Chicago Tribune, telling the story of one young man living in the North Lawndale neighborhood of Chicago. The second part of the graphic is a set of statistics that was included with the article. 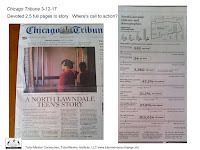 The Tribune devoted 2 full inside pages to this story, and a commentary on page 2 of today's (March 13) paper. Only briefly were non-school programs mentioned on Sunday. No discussion was in the paper about what programs are available, are there enough, how to help them grow, etc. Thus, in a "Rest of the Story" article that would be the focus. 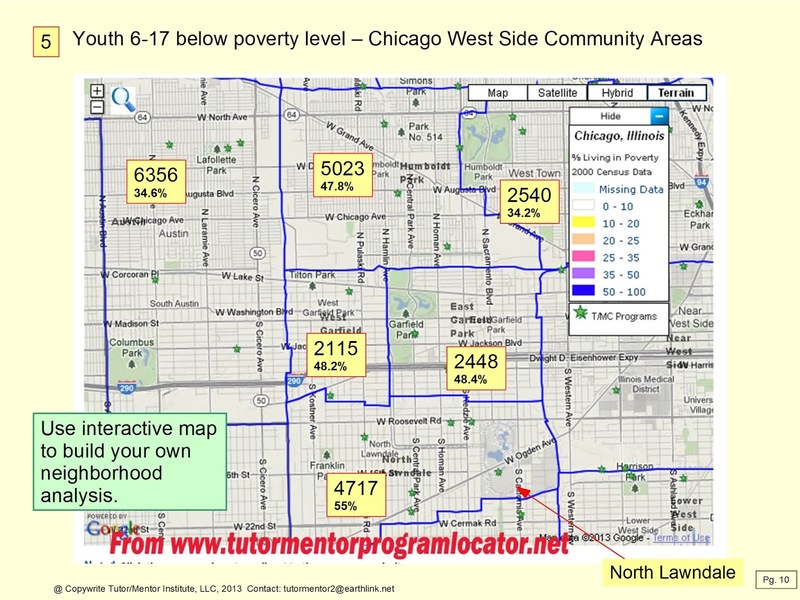 Here's a page from a 2011 presentation that shows the number of kids, age 6-17, below poverty line, in different community areas of Chicago. 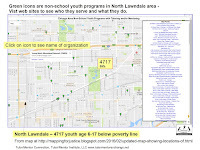 North Lawndale is at the bottom of the map, and has 4717 kids. 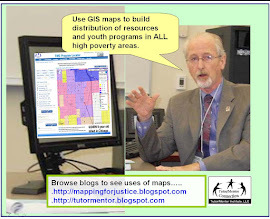 This map was created using the Tutor/Mentor Program Locator, created in 2008, but not updated since 2010, due to my lacking the funds or talent. Yet, it's still a usable tool. Click on green stars to see contact information and web sites of youth orgs in the directory. T/MC surveys used in the 1990s to collect program information intended to create a more sophisticated understanding of program availability. Thus, on this search page, you're able to sort by type of program (pure mentoring, pure tutoring, or combination tutor/mentor) and by age group served (elementary, middle school and high school). 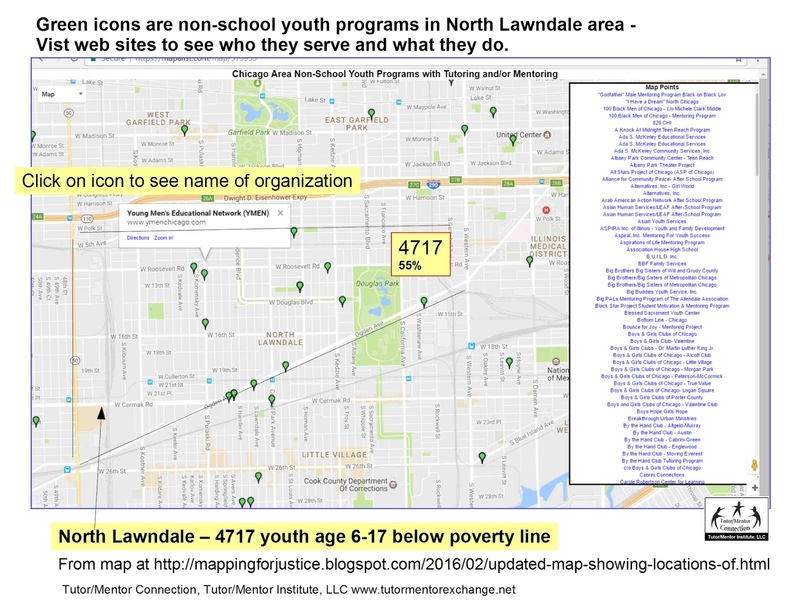 Using the map layers feature on the Interactive map, leaders could quickly see that there are too few programs serving older youth (and all youth, really) and a poor distribution of existing programs in many of the high poverty areas of the city. I don't find this type of analysis anywhere on the Internet (If you know of others doing this, please share the link in the comments below). 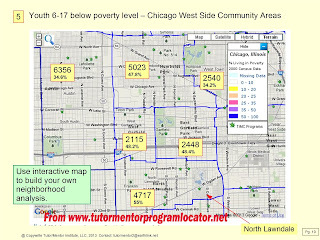 Here's a more updated map and list of Chicago programs showing the North Lawndale area. Click on each icon to find the name of the organization. 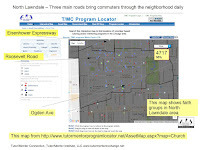 My goal since 1993 has been to create a map platform that could be used to better understand the location and availability of non-school tutor/mentor programs in Chicago so leaders could help existing programs grow, and create new programs where needed, using the same strategies that corporate offices of large retail organizations use to make high performing stores available near potential customers. I've never had the resources or partners to do this as well as it needed to be done. The service is still needed, in 2017, in Chicago, and in other cities. In the asset map section of the Program Locator you can create map overlays showing banks, colleges, faith groups, etc. in different areas, such as North Lawndale. At the right I'm pointing to another web site that enables users to see businesses in different parts of the city. In this case it is showing banks. 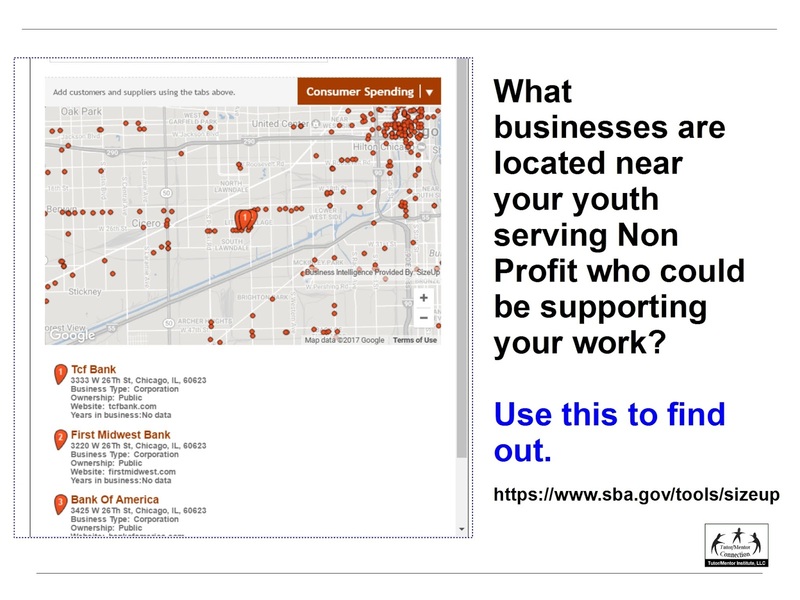 Since there are more than 4500 youth in the area who could benefit from non-school programs, and the map shows that many blocks have no programs, helping existing programs stay in business while helping new programs grow and reach more kids should be the focus of leaders in this area. At the same time, helping programs learn from each other, and from programs around the world, so each is constantly improving it's ability to attract and retain youth and volunteer participation is also a goal. Several sections of the Tutor/Mentor library point to different types of youth serving programs that could be models for Chicago programs. This information is intended to be used by groups of people in business, faith groups, media, colleges, non-profit networks, etc. to build strategies that fill the neighborhood with a wide range of birth-to-work youth support programs, supported by the different "assets" who are already located in the neighborhood. There's a lot of information. Thus a learning process needs to be included as part of any support organization's strategy. 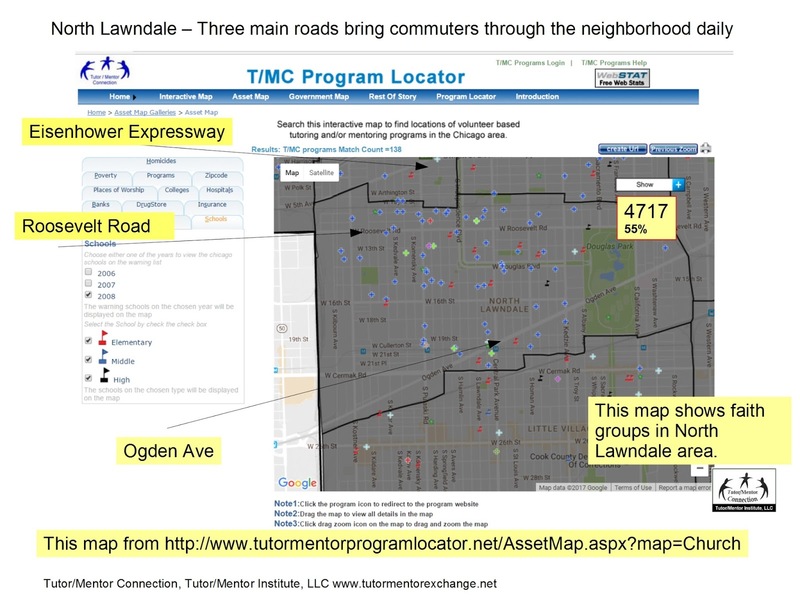 This is another map from the Program Locator, showing the North Lawndale community area, and showing faith groups and other assets. In this case, I've highlighted Ogden Ave, Roosevelt Road and the Eisenhower Expressway, which are three main roads bringing commuters from the suburbs through this neighborhood every day on their way to work. Part of the effort to support the growth of youth programs in the area would be an on-going effort to motivate some of these people who "drive by poverty" to visit web sites and read blog articles like this, then join in efforts to help programs attract the ideas, talent and dollars each program needs to sustain it's efforts and constantly improve its impact. I put these graphics in this SlideShare presentation so anyone could use this in an effort to mobilize and educate others. I've also drawn from a collection of strategy presentations in the Tutor/Mentor Institute, LLC library for this article. On the Tutor/Mentor blog I've written a couple of articles recently inviting others to a "do over", using the ideas and strategies I've created since 1993 in a new organizational structure and effort that aims to have a much greater impact in the next 20 years than what I've had in the past 24 years. I think many others could communicate ideas like this article better than I do. I invite you to "do it over", creating your own version, using your own talent, and reaching your own network of followers. Visit this page to see how interns working with me in Chicago have been doing this for many years. It's not enough for the media to make us feel bad about young people living in poverty. They need to point us to information and strategies that motivate people who have the ability and resources to provide time, talent and dollars on an on-going basis to support the growth and long-term operations of needed birth-to-work support programs in every high poverty neighborhood of Chicago and other cities. If the media don't do this regularly, it's up to us. That's the goal of telling "The Rest of the Story" every time the media uses its space to attract reader attention to the problem. 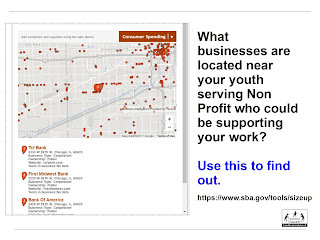 I've been reviewing links in one section of the Tutor/Mentor Connection web library and found a site that allows you to map locations of different businesses in different geographic locations. I created this map, showing banks in Chicago on the near SW side of the city. 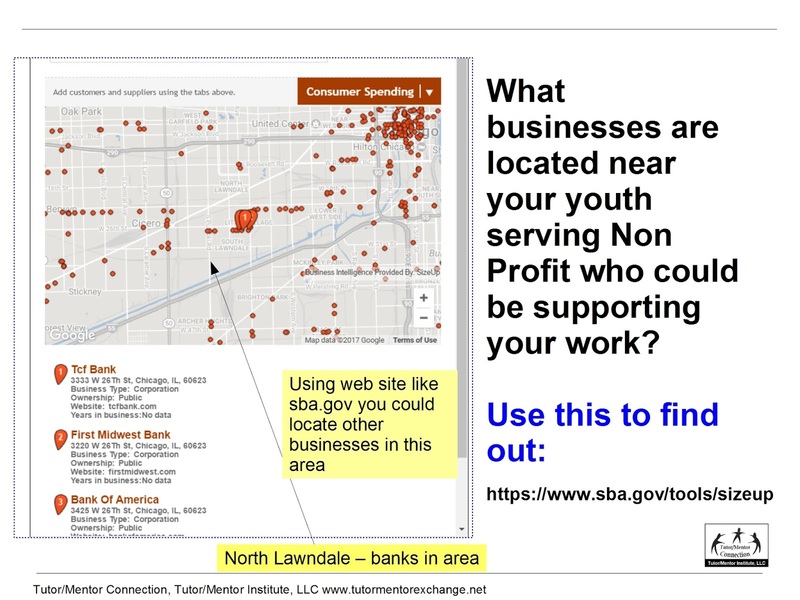 If you were operating a youth program in this area, reaching out to these banks for volunteers, board members and donations would make sense, since they share the same geography and its problems and opportunities. Using the site you can create maps showing a wide range of businesses, not just banks. The site was not created as a resource for non profits, but instead to support small business development. However, I think creative non profit leaders could use it the way I've described. Visit the site, click here, and make your own maps. 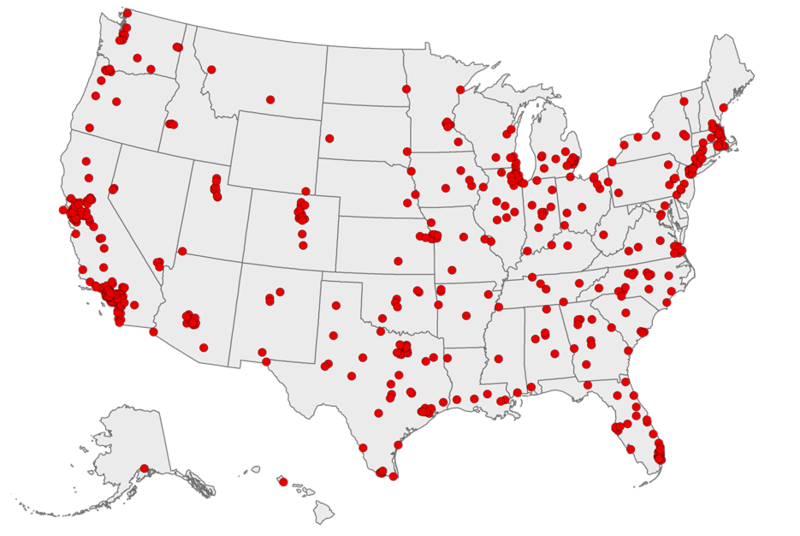 This map shows 500 cities across the United States which are included in a new data hub created by the Center for Disease Control (CDC) and the Robert Wood Johnson Foundation. You can use the interactive map to create your own map view, or look at PDF reports for each of the 500 cities. This link points to Chicago maps. Looking at the maps you quickly see a correlation between poverty and poor health.